So. Sometimes, you have two friends whose only connection is that they know you (but not each other), but, from what you know of each of them individually, you are sure that if they met they would get on and be friends themselves. I have had that feeling about two particular people for a few years now and yesterday I found out they had made contact and did indeed get on. Unfortunately for me, they have both been dead some three hundred years. Let me tell you about them. Back in the nineteen eighties – before some of my readers were born (harrumph, harrumph) – I was studying archaeology. Somehow (and the details are hazy) I came across Sir Thomas Browne: a doctor in Norwich in the seventeenth century. 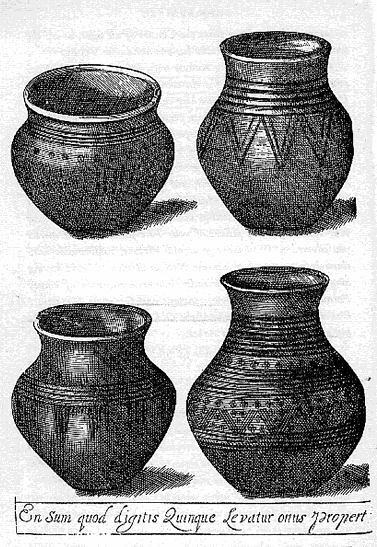 Back in those days a doctor had broad interests, so Dr Browne wrote a pamphlet describing a collection of Anglo-Saxon funerary urns dug up in Norfolk in the 1650s. He was something of a thinker, so the pamphlet – Hydriotaphia (or Urn Burial (and I modernise the spelling)) – covered far more than just the discovery of the burial urns, becoming in the end a mediation on mortality. I even stole a phrase as the epigraph for my undergraduate dissertation. A little later – again through the archaeology – I came across John Aubrey, a seventeenth century landowner (not a very successful one) and antiquarian (very good at that). Aubrey discovered the ‘Aubrey holes’ at Stonehenge and recorded the stone circle at Avebury. The only question remaining is whether they would have enjoyed knowing me? Now there’s something it would take more than another twenty years to answer.